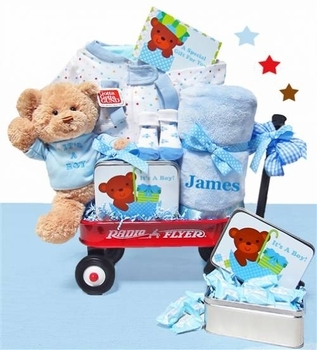 Welcome the new baby with our classic mini wagon gift set for boys! The cute mini Radio Flyer wagon comes loaded with lots of coordinated necessities to help parents prepare for the new arrival. This set features a large, soft, plush 'Gund' Teddy Bear that is sure to become baby's fast friend. I just love this little wagon set. I've been buying these for clients after my favorite woof wagon was discontinued. After seeing it, I have to say I like this set even better. The blanket and teddy bear are great quality, everything is nicely presented and your embroidery looks fantastic! Please don't discontinue this one! I bought this for a co-worker and she was very pleased with all the contents. Adding the name to the blanket really makes this gift so much more personal and she was so thankful for everything. This was so cute and got a lot of comments from everyone at my sisters baby shower. She LOVES the blanket with Jeremy embroidered on it and everything else is very good quality too. This is a perfect gift to welcome a baby boy and I will order another one for my cousins baby boy expected in about 2 months. Very nice gift for a boy baby. Everything was really nice including the wagon! I bought it for my nephew and my sister loves everything it came with. She especially loves the personalized blanket!!! She said she tries not to use it much so it stays clean and she can save it as a keepsake. She still uses it anyway because it is really soft and fluffy and my nephew falls asleep easily on it! ProsEverything in it is good quality The blanket is awesome! !